Flu season is upon us: Get your kids vaccinated. Do Your Kids Need the Flu Vaccine? 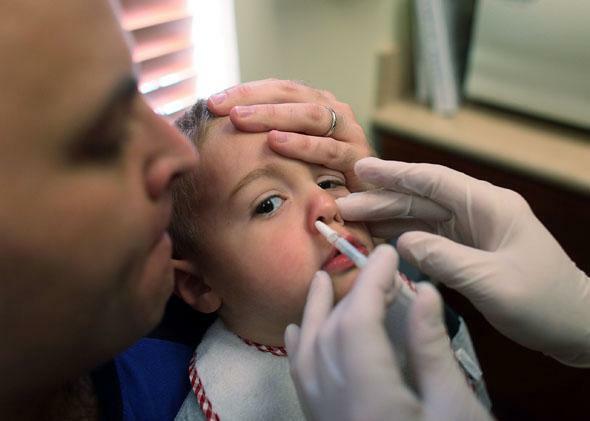 A 2-year-old receives a nasal flu spray vaccine in 2009 in Florida. School started a month ago, which means that your child has already caught at least one cold. Viruses love classrooms like my kid loves ice cream, so with flu season right around the corner, it’s smart to get your child a flu shot. Or is it? We all know people who, after dutifully getting jabbed, wound up chained to a bed for a week anyway. And there was also that 2009 Atlantic article arguing that perhaps “everything we think we know about fighting influenza is wrong,” including the notion that flu vaccines help. So is it really worth dragging your kid to the doctor to get an inoculation this year? Yes—but research suggests that not all ages benefit equally, and some flu vaccines do seem to work better than others. If you’re the parent of a 2- to 7-year-old, you should call your pediatrician now and make an appointment to give your kid FluMist, the flu vaccine nasal spray (yup—no needles), which is actually quite effective, much more so than the flu shot in this age group. Kids older than 7 also seem to benefit more from the nasal spray than the shot, but the vaccine’s protection isn’t quite as pronounced. The toughest decision falls on the parents of wee ones between the ages of 6 months and 2 years, because the only approved vaccine for them is the shot—yet very little research has been conducted on its safety and efficacy in babies and young toddlers. First, let me explain the different flu vaccines. There are many, but they can be lumped into two main types: shots and nasal sprays. The shot contains either whole killed viruses or a mixture of viral proteins. The nasal spray is a live attenuated vaccine, which means that the viruses in it are alive, albeit weakened. They are also “cold-adapted,” which means they’re engineered so that they can replicate in your nose, where temperatures are low; they can’t, however, thrive in the warmer environment of your lungs, where flu infections usually set up shop and do damage. It’s important to note that neither the shot nor the nasal spray can actually give your kid the flu, but both can cause mild reactions such as runny noses, coughs, headaches, and tenderness at the injection site. What about kids between the ages of 7 and 18? It’s unclear which vaccine is best, because there’s been very little research on the nasal spray in this age group. A 2006 trial in asthmatic kids aged 6 to 17 found that the nasal vaccine had an edge over the shot—4.1 percent of kids given the nasal spray caught the flu, compared to 6.2 percent of kids who got the shot—but it’s impossible to say whether asthmatic kids’ responses are representative of the larger pediatric population. When Taiwanese researchers compared the effects of a live nasal vaccine versus an inactivated shot in a 1991 clinical trial, they found that the nasal spray worked best for kids under 9, but that the shot worked better in kids aged 10 through 18. But it’s also hard to extrapolate from these findings, as the nasal spray used in this study protected against half as many types of flu as the one approved in the U.S. today. Now, what if you’re a parent to a child under the age of 2? The nasal spray is only approved for kids over 2, so you’re stuck with the shot. Yet only one controlled trial has tested the flu shot in infants, and scientists differ in their interpretations of what it found. Some researchers concluded from this trial that the flu shot is no more effective than a placebo in children under the age of 2. Yet the shot did work well at preventing flu in the first season assessed in the trial—its vaccine efficacy that year was 66 percent. Infants and young toddlers didn’t, however, derive much benefit from the vaccine the following year, when the flu happened to be much less common. When you combine the evidence from the two flu seasons, the overall benefits of the vaccine seem negligible, but the trial showed that the vaccine did provide protection in one out of the two years. This raises another important point about the flu vaccine: Its efficacy varies from year to year, because it’s different from year to year. About nine months before flu season starts, scientists at the World Health Organization make an educated guess as to which viruses are likely to circulate the following year (influenza evolves rapidly), and they aren’t always right. When they’re wrong, the vaccine can still provide some cross-protection, but it often doesn’t work that well, and vaccinated people still get sick. Clinical trials on flu vaccines are, of course, affected by the luck of this draw, too—trials conducted during well-matched years conclude the vaccine is more effective than do trials conducted in mismatched years, which is why many trials try to test the vaccine over multiple flu seasons. If all this information is starting to make you feel feverish, here’s some simple advice. Get your kid inoculated. If she’s over 2 but under 18, request the nasal spray, which seems to work much better than the shot and will certainly incite fewer screams—and you may want to do it soon, because supplies are limited: Less than a quarter of this year’s vaccine stock is the spray. (If you can’t get the spray, do the shot. Luckily, overall flu vaccine supply shouldn’t be affected by the government shutdown.) If you’re the mother of a baby or a 1-year-old—as I was last year—then yes, the science is less clear, but I think it’s still worth vaccinating. Absence of evidence doesn’t mean evidence of absence; if more trials were conducted on infants, scientists might find more evidence of benefit. Or they might not. But it’s a risk/benefit calculation, and the risks associated with inoculation seem quite low compared to the potential benefits of protection, especially since infants are at a high risk of suffering complications from the flu. Is it possible that the vaccine won’t work well this year or that this flu season will be extremely mild? Sure. But there’s no way to know. And I’d rather waste a morning at my pediatrician’s office—and yes, I’ve already made an appointment—than gamble with my family’s health.